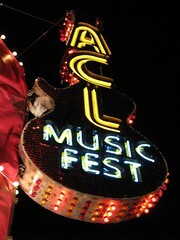 The Austin City Limits music festival is underway. Liz and didn’t get there until about 5pm on day one, we both had work to do. Fortunately we didn’t miss any bands that we were dying to see, so it worked out. We started with Patty Griffin, Liz was excited about seeing her. I don’t know any of her music, but just as you’d expect she put on a great show. The next show on our list was Mates of State. After years of attending these festivals we’ve learned that the good t-shirts go early, so we stopped by that tent on our way over to the Austin Ventures stage to grap our favorites. Mates of State were great. I had never heard their music before, but we really enjoyed them. I couldn’t distinguish the words they were singing, but the music was pop. They had two cellists and a violin on stage with them, which I thought was cool. David Byrne was next. Man, that dude is awesome. He had a full band plus several dancers and backup singers, and they all wore white. He played several originals, and at least two Talking Heads songs as well, Once in a Lifetime and Life During Wartime. They sounded awesome, and the crowd really got into the show, too. After a while all the dancers in white were a little much, but the show was still a LOT of fun. After David Byrne we walked over to get some food and catch a bit of Alejandro Escovedo and The Swell Season. Escovedo was great, but I’ve seen him a few times before so we didn’t stay long before walking over to Swell Season. I wasn’t really impressed with them, but to be fair the acoustics were poor where we were sitting and we couldn’t really hear them. At this point the dust started to get to me, and I only had 3 hours of sleep the night before, so we left right after that. At this point it was 8:30, we stopped at the chair check so that Liz could leave her chair over night, but they were closed! They close the chair check before the shows end? WTF?? By the time I got home I was coughing and sneezing pretty regularly, which means that the dust in Zilker Park is pretty bad this year. The weather was perfect. Temps in the 80’s and lots of big puffy clouds floating by. But, its dry, and when thousands of people walk through Zilker they kick up the dust. I’ll be taking a bandana with me today. Just in case anyone reads this within the ACL management reads this, please please please water Zilker. Breathing dust is aweful. And to the bands, we don’t give a rip about your comments on Obama, McCain, or the bailout. We want to see great music. Focus your attention there and we will love you for it.